Perhaps not-so-surprisingly, the driving factors are collaboration and productivity, as opposed to any ecological or "green" concerns. With this in mind, we take a look at the advantages of going digital, and outline how workers can embrace this new digital-first paradigm to collaborate more, do things faster and work more efficiently than ever. One advantage for businesses to ditch paper and perhaps the single most important factor is convenience. Digital data is both highly searchable, and is also easily transferable. What's more, the mature state of cloud services today means that you can expect the information you store online to be available across whatever devices you may own -- be it a smartphone, tablet, PC laptop, Mac computer or even a Web browser at a cybercafé or hotel lobby when on a vacation. Digital documents are also clearly suited to data backup. Despite the calibration required to get things set up in a way that works for you, it's infinitely easier to make a copy of digital data versus photocopying stacks of printed invoices or bills. And a growing list of cloud storage services (Dropbox and SugarSync, to name two) have taken document storage a step further by saving multiple versions of a doc so you can revert to earlier versions of a document if necessary. Finally, digitization opens the door to greater levels of collaboration at work by making it easy to collaborate with coworkers on only the relevant data. On this front, an entire generation of online tools are available for a diverse range of tasks such as time tracking (Toggl), project management (Asana) and collaboration (Yammer) of which all are captured digitally without printing out a single piece of paper. So how should you go about joining the digital document revolution? One of the starting points for digitizing your business docs is to decide on a platform for filing away notes, ideas and documents. Not only does it serve a critical role as a virtually unlimited digital repository for filing important details, charts, audio clips or screen grabs, a good digital system will make it easy to organize and find the information when you need it. The popular Microsoft OneNote allows you to enter rich text, images, media files or even drawings into fully searchable notebooks. 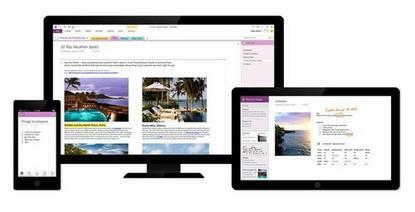 OneNote works on a variety of platforms, including Windows PCs, Mac computers, Android and iOS devices, and even from a Web browser. The strength of OneNote is its support for freeform data, with complete freedom to align (or misalign) text and all supported objects. The latest version also adds Optical Character Recognition (OCR) for images, making it easy to search for specific words within new images, and adds support for Dropbox on top of Microsoft's own OneDrive cloud storage service. Evernote is another popular, free, online note-taking service. It offers effectively unlimited storage, albeit with a monthly upload cap (which is much larger for users willing to shell for one of the two fairly inexpensive tiers). The advantage of Evernote is its support for an incredibly diverse list of platforms, which includes native support on the BlackBerry 10 smartphone, third-party clients for Linux, and even scanners with the capability to scan straight into Evernote. Notebooks can be shared among multiple users including those without a paid account while individual notes can be shared publicly with a unique URL. Evernote also saves multiple versions of a document, which ensures that any accidental edits can be undone. Finally, paid users get to work offline, and can utilize the service to conduct text searches through Office docs and PDFs, as well as stored in Evernote. For those of us who keep a to-do list, Trello and Todoist are digital equivalents that can facilitate collaboration with colleagues. Google Keep captures notes, lists, photo and audio via supported Web browsers and mobile devices. Finally, there is the text-only SimpleNote, or even the Notes feature in Microsoft's Office 365 or an on-premises Exchange Server deployment. Obviously, all the talk about digitizing data for productivity is for naught if you have to manually key stuff into a system at a later date. This is why digital notebooks such as Evernote and OneNote are so popular they allow data to be digitized on the spot from a variety of devices. For users who perform a lot of data entry on the move from a tablet or smartphone, it may make sense to consider buying a portable keyboard such as the Logitech Keys-To-Go keyboard or Microsoft's upcoming Universal Foldable Keyboard. For popular tablets like the iPad, there's also a large selection of keyboard cases and clip-on keyboard covers to choose from. With its ballpoint nib, the Livescribe writing tool feels like a real pen, even as it simultaneously and wirelessly captures all pen strokes to an iPad or iPhone device. Designed for those who prefer to scribble down notes and diagrams, notes can even be synced to OneNote or Evernote. As a bonus, words are transcribed using OCR technology as they're written. The downside is that a special notebook available in a variety of form factors is required for the data capture to work. Livescribe also works with standard paper that's been pre-printed with the requisite unique pattern of dots, which is available as a free download. And a new generation of third-party stylus such the Wacom Bamboo Stylus Fineline and the Adonit Jot Script even boast palm rejection capabilities so that users can place their palms on their tablet much like they would with an analog notebook or old-school pad of paper. Finally, devices like the Surface Pro 3 and the Samsung Galaxy Note phablet also come with a stylus for writing directly onto it. These integrated styli typically work a lot better than third-party add-ons. Having the tools and the capability to natively capture your notes, docs and the like in digital form is a good thing. But that doesn't mean you're going to stop receiving paper bills, invoices, statements, receipts, business cards, product brochures and other printed material. One of the best ways to minimize ink-on-paper collateral is to aggressively digitize all documents whenever possible. You have a variety of options. The easiest is to use a smartphone app such as Scanner Pro to quickly capture everything from business cards to paper printouts. Quality may vary, however, depending on such environmental factors as lighting and the quality of your smartphone's camera. A more robust alternative is to make use of an automatic sheet-fed scanner such as the NeatConnect Wi-Fi scanner to scan printed sheets straight to OneNote or Evernote. Portable scanners also exist, such as the battery-powered Doxie Go Wi-Fi and Doxie Flip. The former lets you scan wirelessly to an iPad or iPhone, while the latter is best described as a portable flatbed scanner that can be inverted to scan items that are fixed in place, or which are too thick to pass through a sheet-fed scanner. Finally, the Fujitsu ScanSnap PV600 is a deskbound scanner that simplifies digitizing magazines and bound books. Items are placed face-up on its scanning mat. The scanning takes about three seconds to dump into a USB-connected computer. Any curvature in the pages is automatically smoothed out via software, resulting in a high quality capture. Depending on your needs, the ScanSnap PV600 could allow you to continue scribbling down your ideas and notes in a physical notebook, yet be able to quickly scan the physical pages into their digital notebook of choice at the end of each day. Of course, this is just the tip of the iceberg when it comes to digitizing your work. There are hundreds of tools that exist to facilitate the full range of business activities and processes without ever having to involve a single printed sheet.